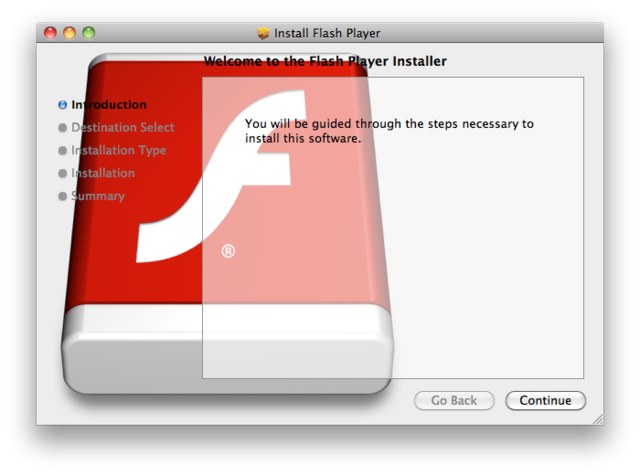 Hot on the heels of last week's Mac malware posing as a PDF is a new piece of malware posing as something even more insidious: a Flash player installer. Security firm Intego was the first to post about the new malware on its blog, noting that although the company has only received one report so far from a user who downloaded it, the malware does exist in the wild and may trick Mac users who don't yet have Flash installed. Continuing through the installation process will result in the trojan deactivating certain types of security software (Intego specifically noted that the popular Little Snitch would be affected) and installing a dynamic loader library (dyld) with that can auto-launch, "allowing it to inject code into applications the user launched." The trojan then reports back to a remote server about the user's MAC address and allows the server to detect whether the Mac in question has been infected or not. The threat is currently marked as "low," but Mac users are advised to follow safe security practices—don't open files or attachments that you don't remember downloading, and turn off Safari's setting for opening safe files automatically. It's also worth noting that Apple now updates its malware definition file on a daily basis, and has already updated it to address the PDF trojan discussed last week. If you haven't already scoured the Internet for a malicious version of the Flash installer, then it's likely Apple will have added the new malware to the file by the time you run into it. "Then, Lancelot, Galahad and I jump OUT of the rabbit..."
Summary: A newly discovered Mac vulnerability disguises itself as a PDF to trick users into opening it, which installs an Apache server on your Mac. Luckily it hasn’t been weaponized. Yet. 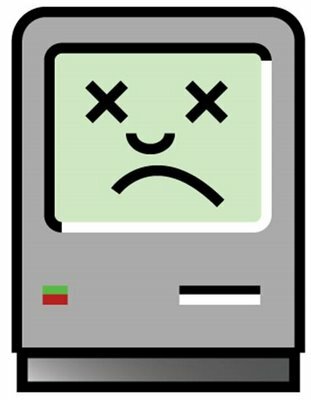 Just when you thought that it was safe to start using your Mac again comes a report that a new PDF vulnerability may be targeting Mac users. F-Secure notes that the vulnerability disguises itself as an Adobe Acrobat (PDF) file in an effort to trick users into opening it, which of course, triggers its payload. 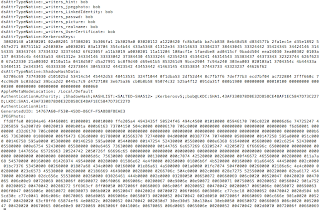 It even opens a bogus Chinese-language PDF in order to deceive the user and avoid detection. 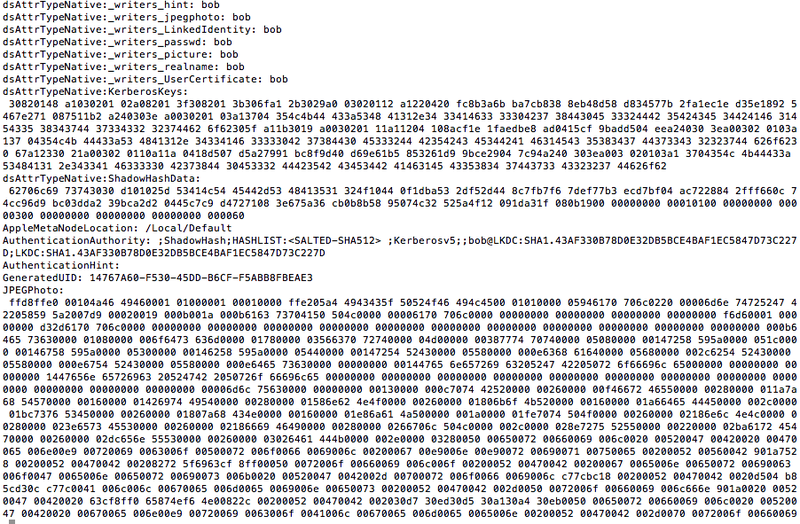 The payload, Backdoor:OSX/Imuler.A according to F-Secure, then runs in the background. The good news, I suppose, is that Revir.A is fairly innocuous at this point. The payload is a bare Apache installation that is “not capable of communicating with the backdoor yet.” The going theory is that the author may have leaked it to see if any of the antivirus detectors picked it up. Luckily, someone did. It’s important for Apple to act swiftly on this one. 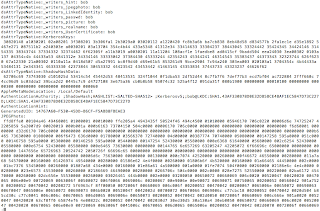 From the looks of things Revir.A probably wouldn’t be too hard to weaponize and we’re not sure how many people might already have the source code. Apple: you’re on the clock. The dedicated Skype application native to Apple’s iPods and iPhones enables attackers to steal contact information by simply sending a malicious message. Security researcher Phil Purviance warned Skype about the vulnerability on August 24th and shared his findings with the public on September 19th, according to a SMH report. By exploiting the vulnerability, Skype friends can send a text message harbouring malicious code to a target and steal their entire address book. By simply viewing the message the victim's address book will be uploaded behind the scenes, oblivious that a hack is taking place on their beloved phone. Taking to Twitter, Purviance said Skype was working to release an update that would patch the hole sometime this month. The publisher of Skype's website recognised the issue and said their "working hard" on a fix, which they hope "to roll out imminently." "In the meantime we always recommend people exercise caution in only accepting friend requests from people they know and practice common sense internet security as always." Purviance noted that the vulnerability affects Skype version 3.0.1 and its earlier releases. On YouTube, he posted a proof of concept video documenting an exploit of the software vulnerability. While this is mostly Skype's problem, you would think that Apple's strict team of brilliant app inspectors would have been able to identify this before it got out. Guess not.